I have completed making swatch samples for my Craft Yarn Council knitting 1 certificate. Hurray! Other yarn projects have taken a back seat for a while but that's OK because rotating projects are entirely acceptable for yarn addicted people such as ourselves. I love how learning to teach makes you learn new techniques and improve your existing ones. I've learnt "european" knitting, cable cast on, feather and fan stitch and also discovered what I should improve. I've realized that my purl stitch is far looser than my knit stitch working on the first two swatches which call for 5" garter stitch squares in knit and purl. My purl swatch is simply sloppy requiring far fewer stitches than my neat knitted candidate. But according to one of my proficient knitting friends (she can knit Fox Paws without assistance) this is not unusual and can be fixed. A quick online search led to a solution. Hurray for Ysolda Teague! Knitting designer, Ysolda Teague, has a collection of excellent photo tutorials on her Technique Thursday page. This is where I found out how to make my purl stitches tighter. At knitting designers Tin Can Knits, 2016 is the Year to Learn Something New and they even have a hashtag #TCKnewtricksKAL How fun! Blogger, designer and teacher Marie Segares of Underground Crafter has a great archive on her blog Tips Tuesdays the most recent being how to join your first (or next) CAL (crochet along) - always a great way to improve your skills! 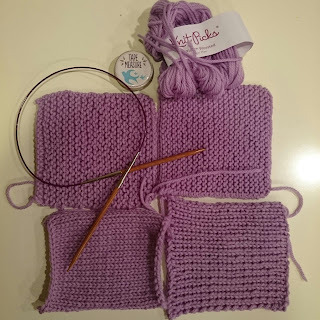 Blogger, writer and crocheter Kathryn Vercillo of Crochet Concupiscence provides very clear photo tutorials of crochet stitches and also gives a link to other crochet tutorials if you'd like more! New York store and online resource for "needlecrafters of every ilk" Purl Soho provides both knit tutorials and crochet tutorials on their beautifully presented site. I know this is just a tiny selection (and I haven't even delved into the world of video tutorials), so I'd love to hear from you if you have a particular favorite place to learn new techniques online. Just let me know in the comments section below!